It may have been a day off from classes, but several hundred Lawrence University students, staff and faculty put Dr. Martin Luther King’s legacy into practice in the Fox Valley community. 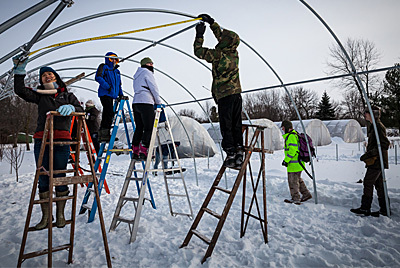 Students braved cold temperatures to build hoop houses for Riverview Gardens as part of Lawrence’s annual Dr. Martin Luther King Jr. Day of Service. From helping build hoop houses for an area community garden, baking treats for the local warming shelter, knitting scarves for the homeless and leading area students in after-school art, dance, music and sports activities, Lawrence volunteers registered to provide 587 hours of service on the holiday honoring Dr. King (1/20). In all, Lawrence partnered with 10 local organizations for a day of community engagement: the Boys and Girls Club of the Fox Valley, Brewster Village, Riverview Gardens, Bethesda Thrift Shop, Fox Valley Warming Shelter, Fox Valley Humane Society, CHAPS Academy Creative Counseling programs, National Alliance on Mental Illness, SLUG and Glamour Gals. Najja Gay, a junior from Charlotte, N.C., helped organize clothes at Bethesda Thrift Shop, one of 10 area agencies Lawrence students provided volunteer service to on the Martin Luther King holiday. “Our community partners provide an opportunity for Lawrence students to learn beyond the classroom, to gain a new perspective and to further explore their own beliefs,” said Kristi Hill, Lawrence’s director of volunteer and community service programs. “This year’s ‘What do you believe’ theme encouraged students to first explore their beliefs with a book discussion and then encouraged students to put those beliefs into action through service opportunities available both on and off campus.